The words, "Gosh," "Gee," "G-d Dxxx It," "Holy Moly," "What the "F#*&%#," or even "Goodness me," can trigger some discomfort among pious Christians. For some, these words amount not only to swear words, but they are in contempt of the LORD's name. Worse, it breaks or in danger of breaking the third commandment which clearly says, "You shall not misuse the name of the Lord your God." There are many arguments for or against. On the one hand, those who use God's Name liberally say that it is simply a human expression without any intent to hurt or harm God's Name, or the beliefs of Christians. On the other hand, those who are dead against any form of blasphemy no matter how small, will take offense at the way God's Name is used. What is taking the Name of the Lord in vain? The Hebrew word is "shav," which can also be understood as 'empty,' 'false,' or 'vain.' Many English translations prefer the word 'vain' to represent the meaninglessness when using God's Name falsely. This week, I want to reflect upon what this third commandment means for us. Hollywood movies are notorious in using "Jesus" as a swear word. When I watch movies on TV, DVD, or streaming movies from the Internet, the single biggest turn-off for me is when the Name of Jesus is used as a casual swear word. In trying to inject "reality" into movies to reflect the surrounding culture, it has unfortunately propagated the use of swear words to the general public, especially young innocent children still forming their thinking processes. Even with movie ratings, the easy availability of movies nowadays simply means anyone from 2 to 100 can watch any kind of movies. On the Internet, words like OMG ("Oh My God" for short) or WTF, or any form of swear words on social media are expressions of human emotion on one hand, but also trivializing words, and worse, it may trivialize God, the creator of all things, and the creator of all people. Come to think of it, God has given man the gift of creativity. Why are we misusing these gifts by cursing and breaking people down with careless words? Why are we misusing the Name of the Lord? The simple answer is sin. The more complicated answer is pride. The pride to insist that we are above all authority. The arrogance to think that we are higher than God. The sad state of swear words is simply a desire to elevate our human emotions above community considerations. For example, if A screams out "Jesus" as a swear word, and a neighbouring Christian gets annoyed. Will A suddenly proclaims his right to "freedom of speech?" On the other hand, it is so common nowadays, that when a Christian states his support for traditional marriage as being defined as a marriage between a man and a woman, it is almost expected that some groups will scream out labels like: "You're a gay hater!" or "You are homophobic," or worse, "You are a bigot!" It is really hard to be a Christian in such an environment. Sometimes I wonder, do Christians have lesser rights to freedom of expression than secularists or atheists? If Christians are demoted in their freedom of religious expression, chances are, when they stand up against anyone using "Jesus" as a swear word, they will be criticized or even condemned. KEY: Resist people who ridicule God through words. Resist the temptation to empty words of their true worth. 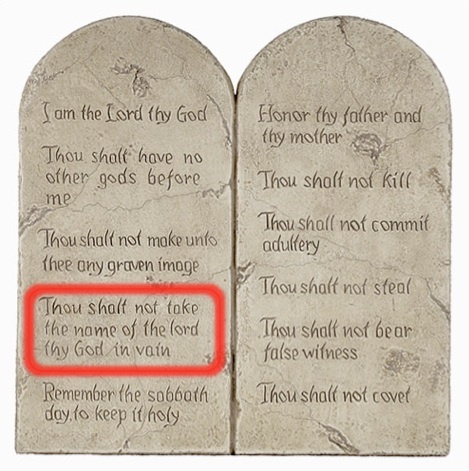 What does the third commandment actually say? I see four sets of doubles. Twice, the Hebrew word 'Lo' (not) is used as a negative warning. The word "LORD" is mentioned. The word "name" is also mentioned twice. The word "vain" is also mentioned twice. Such double words feature an importance that needs to be emphasized. It reminds me of a need for listening doubly hard. When something is repeated in Scripture, we ought to sit up and take notice. When something is repeated within a short verse, we need to be even more vigilant and pay attention to the central point. The Third Commandment is about making sure that we revere the LORD's Name totally, in our speech, in our words, and in our behaviour. The word "in vain" essentially means we devalue God's Name, or we reduce and empty God into what He is NOT. What is taking the Name of the LORD in vain? William Barclay makes it more succinct by describing it as a breaking of a promise to God, or promising something that we do not have the intention of keeping it in the first place. 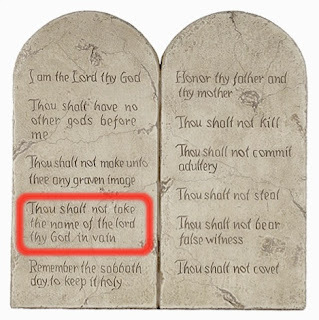 Along this line of thought, I can also add in another way we take the Lord's Name in vain. When we frivolously use God's Name in our daily language. This is where I will turn to next. KEY: Breaking promises is another way of taking God's Name in vain. In Christian circles, sometimes you can hear Christians use pious language. They say 'hallelujah' to people as if it is a synonym to "How are you today?" They prefix what they want to do with "God told me so." They make their words sound more saintly with "Praise God," "Jesus told me this," or "The Spirit told me that." Is that a problem? No if it is true. Yes, if they are simply using God for their own ends. God is not to be used as a rubber-stamp for our motives. God is to be God, and we are to be saved from our own follies and misdeeds. I have heard of people who tries to justify their decisions with God as their witness. The moment they say things like: "God told me to take this job," or "God said to me that I must leave this marriage," they have cemented the door, and terminated any arguments. Thus says the LORD, they insist. Who can speak against God's decree? Who dares to question God? How dare a simple human being argue against a saint who has the Lord's blessing and Name as a stamp to their decision making? Case closed. The person using God's Name in his/her statements has essentially used God's Name as a spiritual rubber stamp of divine authority. Such actions amount to pontification of one's deeds and actions. Now, do not misunderstand me. God does speak to people. God also uses other people to speak to people. The final authority is never one's words. The final authority is God's Word. The final authority is God's Name, period. If we fail to honour God in our words, we have already taken the Name of the Lord in vain. KEY: Before you use God's Name to rubber stamp your actions or words, think again about the 3rd Commandment. The third commandment is about being careful with our thoughts, our words, and our works, lest we be guilty of thinking wrongly of God, saying wrongly about God, and behaving wrongly for God. It is about keeping the promises of God, as God had intended for us, and not subjected to our interpretations. That means, we cannot allow our interpretations to usurp God's authority. Let's say someone comes up to an unmarried woman and says: "God told me to marry you." What should the woman do? If it is true, the woman has no way to argue against God. If she refuses, then she is standing in the way of God's will. She is making things difficult for the purposes of God and will stumble the man who approached her. What if it is false? Then, the woman has every right to challenge that presumptive man about his misusing the Name of the LORD. She needs to question him on the basis of Scripture. She needs to let him know that he is not the only audience in the great address of God. There is a wonderful example of how the Spirit moves in the hearts of two different persons in two different places, and brings them together. In Acts 10, Cornelius had a vision where an angel of the Lord appeared to him, praising him for his many acts of charity. At the same time, Peter too had a vision of the Lord, explaining to him that it is wrong to call something that God had cleansed, as unclean. Cornelius is a Gentile. Peter is a Jew. The same message brought by the Holy Spirit is that both Jew and Gentile are under the same God. Both are moved by the Holy Spirit. When the Lord calls, He will send His Holy Spirit to confirm all things, to counsel us, and to comfort us. Keeping the promises of God is something that the Holy Spirit will be most glad to help us with. 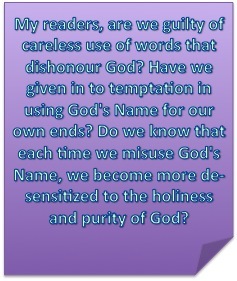 My readers, are we guilty of careless use of words that dishonour God? Have we given in to temptation in using God's Name for our own ends? Do we know that each time we misuse God's Name, we become more de-sensitized to the holiness and purity of God? We need to battle our sinful nature toward vanity for ourselves at the expense of God. We need to clamp shut our constant pursuit of vain things. We must gratify ourselves less and obey God more, talk less and listen more, panic less and pray more. Can we be attentive to God a little more, and be worried about our cares a little less? Selfishness often taints reality with unrealistic demands. Self-centeredness will tempt us to elevate ourselves above God. When we put our interpretation above God, we are taking the Name of the Lord in vain. We are misusing God's Name. We are breaking the third commandment.